The initial shock of the devastating damage caused by an EF4 tornado this past spring in Arkansas has passed. However, there is still plenty of recovery work ahead as demonstrated by Entergy Arkansas’s deployment of over 400 contractors to restore transmission lines, distribution and substations. 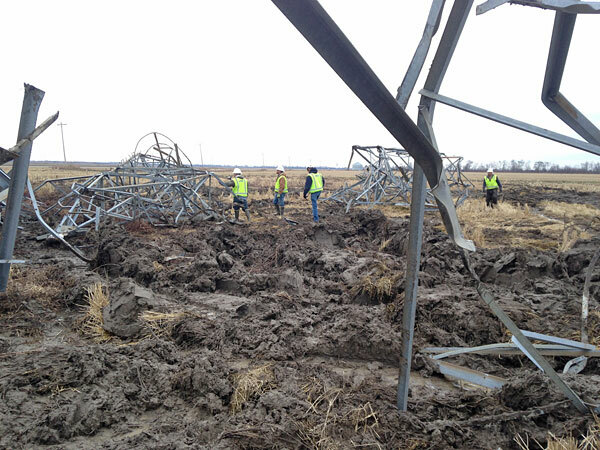 Air2, Auger Services and Power Line Services (all PLH Group companies) coordinated services for their customer, Entergy, to repair extensive transmission line damage to the Mayflower township. The companies worked together to clear the access roads, transport poles to the job site, drill new support foundations, wreck out and replace damaged transmission line structures. Given the extensive damage caused by the tornado, work will continue until this fall. For over an hour on April 27, winds at 166-200 mph tore a half mile wide path of destruction 41 miles through Arkansas. Businesses, schools and homes were leveled. Sixteen people were killed, making this the deadliest tornado in Arkansas since 1968.